Siblings -Tom, Kerry & Julie Fitzgerald from just outside of Canada’s renowned Ottawa Valley, have come a long way from their small town roots. 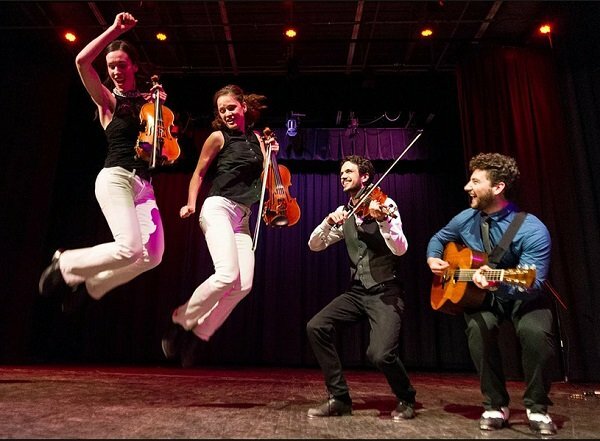 3-time Canadian Grandmaster Fiddle Champions and Ontario Open Step Dance Champions, this unique act features high-energy fiddling and mind-blowing step dancing. It is the rare combination of exceptional musicianship, incomparable step dancing, audience interaction, evident love of performing, and genuine sibling connection that resonates with audiences of all ages and sets this group apart. The Fitzgerald siblings were raised in a musical household, and toured internationally with their family band “Everything Fitz”. Growing up in the Ottawa Valley, they were immersed in the rich tradition of Canadian Old Time fiddling and step dancing that evolved with the arrival of Irish, Scottish and French immigrants. Over time, they have developed their art form to include various styles of fiddle music including Celtic, jazz, bluegrass, French-Canadian, and pop. They have also explored other forms of dance including tap and Irish. The Fitzgeralds continue to push boundaries by fusing traditional and modern styles of fiddle and dance to create their own unique sound and style. Their creativity and passion for experimentation has led them to compose original tunes and arrangements, some of which were released on their latest album. The result is a groovy and catchy new sound and look that appeals to all ages. Despite their young age, these musicians have some notable musical experiences under their belts. Highlights include group/solo performances with: Nathan Carter, Leahy, Natalie McMaster, Cherish The Ladies, Tommy Hunter, Bowfire, Sharon Shannon, Liz Carroll, We Banjo 3, World-Fest, Silver Dollar City, and Branson MO. As members of The Stepcrew, they have had the opportunity to perform with with Carlos Nunez, Solas, and Eileen Ivers. They were guest performers on the prestigious Nathan Carter TV Christmas Special 2017, broadcast by BBC and RTE television. Recently a video of their high-energy dance performance has went viral via Ireland's Independent.ie, with over 3 million views. Their show is a hit at festivals including Milwaukee Irish Fest (US), Dayton Irish Fest (US), Cleveland Irish Fest (US), Iowa Irish Fest (US), Shrewsbury Folk Fest (UK), Maropisa Folk Fest (CA), Stan Rogers Folk Fest (CA), among others.